In this post, acclaimed floral artist Brad Schmidt shares his expertise in creating beautiful home décor. Brad will show us easy techniques for turning ribbons into dramatic enhancements for your Christmas tree. Brad recommends using ribbon with wired edges. They are easier to sculpt into loops or rolls, and they hold shapes better than ordinary ribbons. Brad shares that using ribbon effectively can look complicated, but with a few tips and some practice, can result in stunning, sophisticated displays. Brad’s cascading technique is a great way to give your tree movement while adding dimension and depth. First, tie one end of the ribbon to the tree, and position it so that it drapes in and out of the foliage in waves. 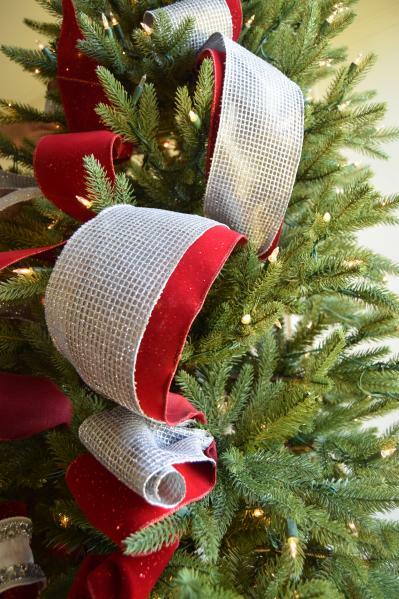 Anchor the ribbon along intervals by securing it to the sturdy PVC needle tips within the tree. For a truly eye-catching adornment, try this technique with two ribbons layered together. Use ribbons of different widths to emphasize the contrast of textures and colors. 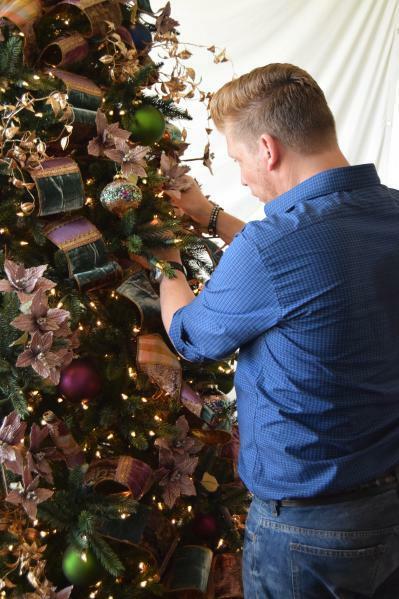 Brad suggests two ways to finish off with ribbon without cutting the material. This way, you can preserve the beauty of the ribbon and use it in its entirety for your next decorating projects. The first is the croissant roll, which is easy to do and leaves an elegant look. Tightly roll the ribbon 6 or 7 times, and then pull down the center to create a spiral. The second technique is the reverse roll. This is perfect for ribbons with beautiful backing and simply requires rolling the end of the ribbon back loosely. If cutting the ribbon is unavoidable, as would be the case if there is a lot of excess fabric, you can simply cut the ribbon at an angle or in a fishtail design. You can then leave that as is, or tie it in a knot or bow for added visual interest. 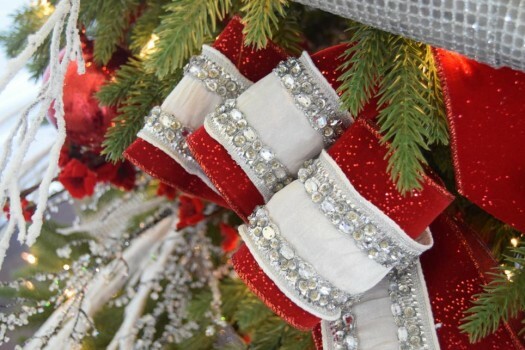 With a bit of practice, you can turn your Christmas ribbons from simple accents into magnificent décor in their own right. 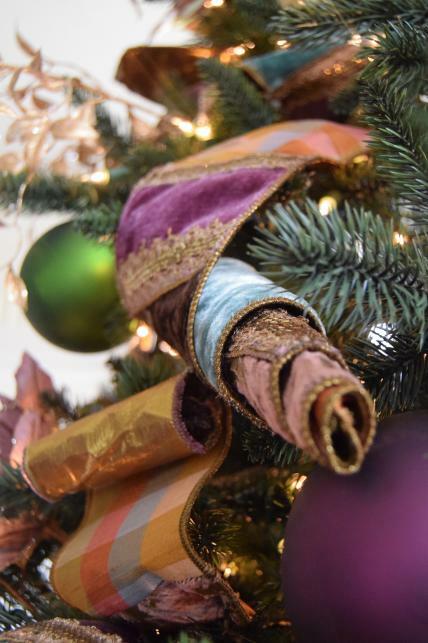 Visit Balsam Hill today and view our wide selection of decorative ribbons. 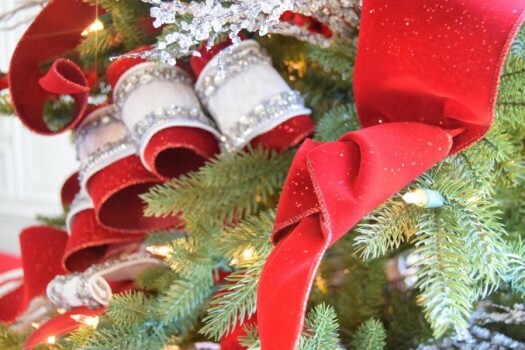 Great post to visualise how to apply ribbon to your tree. How much ribbon would I need to purchase to apply a similar effect to a 9′ tree? Hi Laura, great question! For this, Brad used wired ribbon and floral wire. When creating intricate designs, he recommends using wired ribbon because they are easier to form into shapes and they retain the design much longer. Brad formed the loops first then tied the loops with wire to secure them together, giving them a tighter look. You can then shape the loops to make them fuller or slimmer, whichever you prefer. Do let us know how yours turn out! uge thanks. Un énorme merci à vous Brad. Thanks for taking the time to answer my questions and explaining more to me. so grateful…………..